Homeowners looking for the best soffit and fascia options for their home in Placitas, New Mexico, or a surrounding area, should look no further than ABC Seamless of Albuquerque. Having our products added to your home will create a beautiful classic aesthetic along the edge of your roof. What’s more, all of our products are manufactured on-site to ensure that they fit the exact measurements of your home for a precise and seamless look. Durability – The products we offer are constructed from 28-guage, hot-dipped, G-90 galvanized steel, to create a stronger selection than the alternatives on the market. 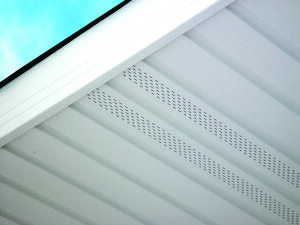 Sturdy installation – The soffit and fascia products we offer will be screwed onto your home instead stapling. This will allow your new installations to hold up better to even the strongest winds and rain storms. For more information about how we can provide you with the best soffit and fascia options for your home in Placitas, NM, or a surrounding area, contact ABC Seamless of Albuquerque today. Make sure to ask one of our highly knowledgeable team members about our convenient financing options available to all homeowners who qualify.